The Russian currency’s upward trend has achieved a psychological victory Wednesday as the ruble traded at 49.90 against the US dollar on the Moscow exchange. This is the first time the currency, named the worst performer in 2014 and the best in 2015, went as high since November 28. 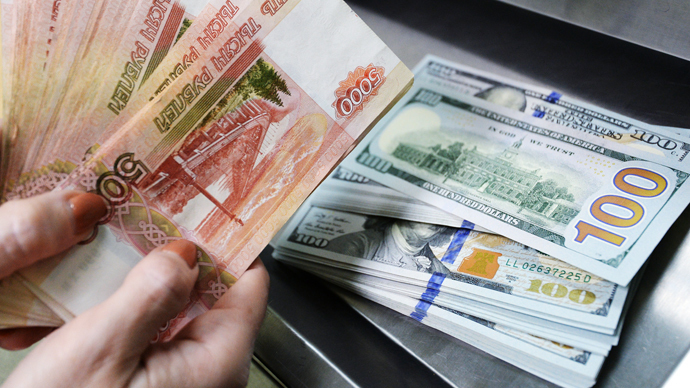 On Tuesday the Russian currency closed at 50.89 against the US dollar on the Moscow Exchange. As for the euro, it went as down to 52.96 rubles Wednesday - 1.21 rubles less than the previous day, when the EU’s currency sold at 54.17 at the close of Tuesday trading in Moscow. The ruble has recovered 16 percent in 2015, and more than 55 percent since December 16, dubbed ‘Black Tuesday’, when the ruble bottomed out against the dollar at nearly 80 rubles. “The ruble remains fundamentally undervalued, there is a lot of momentum out there in terms of investor appetite for yield and risk, and that being the case, I think that ruble appreciation in the near term at least has some way to go, I think we could see another 10-15 percent,” Michael Ingram, a market analyst at BGC partners, told RT. Growing oil prices largely helped the Russian currency Wednesday higher. The US Energy Information Administration said the country has increased its oil inventory levels adding 1.3 million barrels for the week ended April 10. The gain was well below the consensus 3.5 million barrel uptick forecast by analysts and signaled that the US supply was falling. This sent Brent futures for May delivery 5.97% higher to $62.35 for barrel. WTI’s May futures also climbed to $56.09 per barrel, up $2.80 on the day. However, most experts have lately been acknowledging that the ruble was becoming less dependent on the oil prices. Investor appetite for Russia’s treasury bonds, known as OFZs, has been a strong driver of the ruble’s surge. “Interest rates on ruble are extremely attractive - you have double digit returns. It comes in an environment when the Swiss issued a ten-year bond at a negative interest rate,” Ingram said. A rush for Russian bonds is believed to remain in place till the end of April, when the Central Bank of Russia is expected to cut the key rate by another 100-200 basis points from the current 14%.